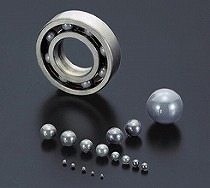 This spherical ball for bearing is used for machine tools, such as spindles that rotate at high speeds and for semiconductor manufacturing equipment that can be damaged by metal dust. It is also used in a special environment, such as in high-temperature chemicals. EC-141 manufactured from silicon nitride with the special gas-pressure sintering method. It excels in mechanical strength and rolling fatigue life.